So, the past weeks I have been busy writing on my other blog “the stories I see 2014” which is part of my extreme lifestyle project. Another reason for me not writing here is because I have tried to get used to my new Berlin lifestyle. Getting used to stuff is something I am not very good at. I am not sure if that´s a good or a bad thing. For me getting used to something has a bitter taste… People can get used to the most horrible things. Getting used to being mis-treated, being poor, fat, alone… Of course getting used to a new situation or behaviour is not always something negative. You could get used to eating healthier or exercising on a regular basis. But what I am talking about is more this negative kind of getting used to something. For me getting used to something basically means to stop asking questions. You get used to something when you stop fighting against something and give up. Just imagine having a big hole in your ceiling… A big inconvenience. But I bet after a couple of weeks you just kind of get used to it and stop worrying about the hole and just work your way around it. Many couples complain about not being “seen” by the other anymore after a certain period of time. They have gotten so used to being around each other and spending time with each other, that they don´t even value their presence anymore. I have a hard time getting used to stuff. Often I can´t stop to ask questions. Instead of getting used to the flawed situation I am in I am trying to find solutions to change the situation and kit the flaws. Could I worry less? Definitely: Yes. But do I want to worry less…? 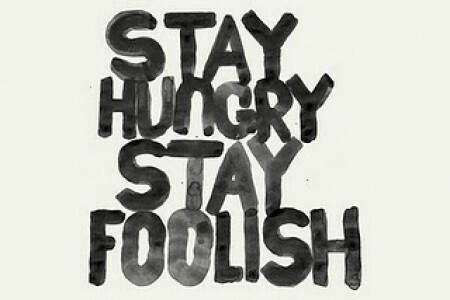 As Steve Jobs said: Stay hungry – stay foolish.